A 32-year-old woman has given birth to what is believed to be the first baby boy to be born on the London Underground. 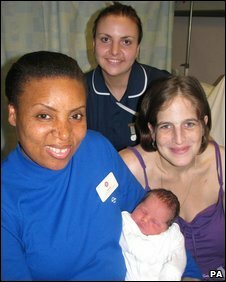 Michelle Jenkins, of Barking, went into labour while travelling on the Jubilee Line on Tuesday. Staff at London Bridge station called an ambulance but Ms Jenkins gave birth in the staff room before it arrived. Three doctors assisted Ms Jenkins after being called via the public address system, before she went to hospital. A Transport for London (TfL) spokeswoman said the birth happened just after 1400 BST. The baby is the first boy and the third child to be born on the London Underground network, officials said. Last December, Julia Kowalska became the second person to give birth on the underground. Baby Jennifer was born at 2135 on 19 December. TfL said the only other recorded birth on the underground was in 1924 when Marie Cordery was born at Elephant & Castle.